Unscrew the 2 screws on the top of unit and slide in one of the slides and then screw back the 2 screws. Do not forget to put back the plastic washer. This is what protects the light projector from snow or rain. To switch out each slide just repeat the process above as exemplified by one of the images above showing a hand pulling out the slide. Note: for a stronger mount, you can tighten the nuts that attaches the bracket to the unit. The projector lamp can be used in daytime or night - projection light works during daytime but obviously the darker the better. It does not need to be totally dark to be able to see the images. 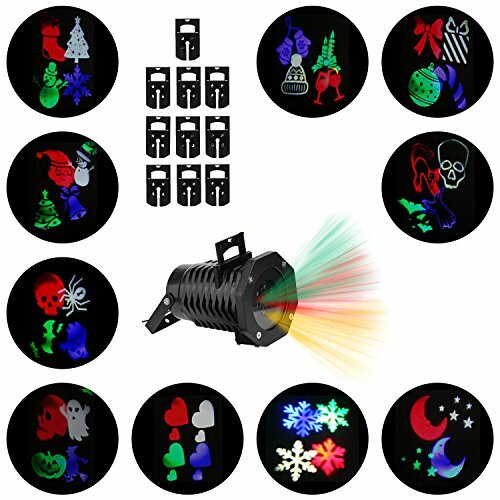 Add a unique touch to your home, yard, garden, pathways and trees with this cool christmas light projector instead of hanging christmas lights outside for your christmas decorations. A great way to get in a festive spirit no matter the occasion - landscape projector light could create a wonderful atmosphere for halloween, christmas, easter and valentine's day. There is weather-resistant cap at the top of projection light - you do not need to be afraid of using it on a rainy day, but please do not use it in heavy downpour. Keeping you satisfied is our top priority. This is why we offer you a 30 days money back guarantee or a product replacement in case you are not 100% happy with your purchase! Do not waste time and place your order now while supplies Last! Hight quality and panoramic motion christmas lights projector - if quality is important to you as it is to us, then we invite you to try this christmas projector lamps with four color patterns. It provides rotating green, red, blue and white colorful spectacles designed to give your event a festive look in minutes. With your safety in mind, we used led projection lighting which does not harm the eyes unlike laser projection lighting. Ten multicolor pattern slides - this high quality christmas lights has different scene patterns which will enable you to create a festive look around your home in minutes. There is snowflake, different gifts for birthday party, snowman, pumpkin, moon, heart, wineglass for dancing party, different animals for children party, ghost and skull heads for Halloween. Great christmas gifts idea and backed by 30 days' warranty - you'll love this christmas lights projector so much that you will have to hide it from your friends - so do both of you a favor and buy one more of this christmas lights for outside for chrismas presents for your friend. We believe in the quality of our product so much that we are backing it up with a 30 days' warranty. Simply send us an email and we will be more than happy to have it replaced for you. If you have any questions about this product by Novapolt, contact us by completing and submitting the form below. If you are looking for a specif part number, please include it with your message.